Advertising to Baby Boomers: What's the Word? Nigel Hollis, Chief Global Analyst for Millward Brown, does a good job bringing us up-to-date on the current status of Word-of-Mouth Marketing. Download the PDF: What's the Word? A 2007 survey conducted by Millward Brown in the United States and the United Kingdom suggested that relatively few people use informal sources of online information (message boards, blogs, etc.) to guide their purchase decisions; the majority of shoppers turn to friends, neighbors and colleagues for advice. We can hypothesize that the power of online word of mouth is diminished by both the receiver’s lack of knowledge about who is providing advice, and the provider’s lack of knowledge about who is receiving it. For Baby Boomers: Make that a fraction of a fraction on the web, double whatever percentage makes up "the majority", and assume anything received has not simply "diminished" - but gone up in a puff of ether. Read The Brouhaha Over WOMM Returns. I've discussed the Dove Pro Age Campaigns - and the commercial that was banned in the U.S. I've never mentioned The Onslaught or Evolution - great spots. Great Public Relations spots. Check out Nigel Hollis' Blog. I learn a great deal from your blog. 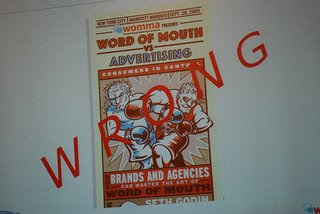 With my lack of experience I am trying to guess at the reasons behind the fact that WOM is not that good to use. Don't mind if I give my 2 pence and please correct and comment if you can. Can it be that the WOM is one of those tools that is hardest to control and direct? I mean, I am not a babyboomer but if I am comparing products online, (1) I sometimes use forums, (2) usually use product review sites and (3) foremost look for independent publications. The latter is easy to verify on its credibility. The 2nd depends on the rules of the site I am viewing and the way reviews are written. The first is something I have to stumble upon in a forum of interest and then I look at who is saying what. If it is a single statement I forget easily. If it turns up in more forums I start responding to the posts by asking questions. Then I also compare with (2) and (3). Oh yeah and then there are all those off line sources like my neighbours. I think I have a good filter and have the ability to see through forum posts written by people to convince me. Even if I trust a message I'd still be checking other sources and the one who is sending the messages will have a hard time finding out which. In my experience a lot of starting (small) businesses try posting casual statements about their products on specific forums and they are easily caught by the forum experts. They usually never try again. WOM may look cheap but it is probably the most difficult (if not impossible) thing to create and control. I definitely agree that only a quality product with great service will generate effective WOM. WOM can not be started by a company. It always starts with a consumer. If they ever find a way to do it succesfully they better keep it a secret as we will start doubting our neighbours if it comes out. As to the DOVE commercials. I think people partially like them because of the eduactional aspects. I love them but I don't buy it and neither do the women I know. Are there any figures on the effect they have on sales? Their brand value surely went through the roof but I wonder if the sales did as well. I have heard complaints from women telling me that the Pro-Age is not for them as they don't feel old. They like the campaign and the message but have a hard time identifying with the visuals and the name. Enough ramblings from Holland. Hopefully somebody will set me straight and educate me a bit more. Don't get me started, Martijn! I won't stop. In the Netherlands my presentation was cut short. I was on for about 20 minutes and they said I would have an hour - but they were running behind. So you missed my WOMM section. Can it be that the WOM is one of those tools that is hardest to control and direct? The simple answer is yes. Especially negative WOM. I think 'creepy' is a good word to describe it all. The Dove campaigns have been very successful globally in selling products. It's a very competitive market - so making a dent at all is impressive. I think the Pro Age line has dipped a bit lately - but it's still strong. Some have complained about the packaging (a bit dull) and a good-sized chunk of women, I've heard, don't like the product after they purchased and used it. It's the scent, mostly. Thanks for the reply and compliment. The women I spoke about are in their fifties. I'm 36, I wouldn't rate my own social environment as a good example. I do however use my values when developing marketing & communication projects. As to WOMM I now get the complete picture I think. The thing is that I don't really consider the examples given by the pro-wommers as typical WOM. It is released by the company and people know about that so it makes them wary from the start. Once you create the distrust or confusion (advertising acting like it's not) other buying behavior comes into play. Once customers find out it is a scheme, your negative WOM will triple. Especially babyboomers are grudge bearing when they have been played fools. The one thing I think works, is quite open and still does a bit of the viral and WOM thing. It's the story of the 18 year old that made an ad for Apple on YouTube and they hired him after seeing it. They basically found their product champion and made him a hero. If you were find out that it is a creepy scheme you won't simply laugh it off. Stick to authentic and transparent messages. You are a company and people know it. If you try fooling them they will get back at you twice as hard. Financially and publicly. Can a Sandwich Be Slandered? Predictions for 2007: How'd I do?